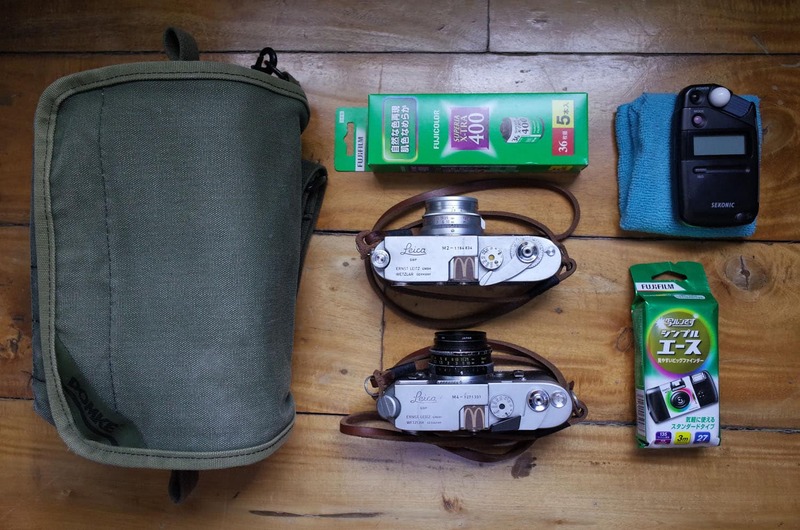 Woah, there are rangefinder bags and then there are super rangefinders on steroids bags. And this is one of the latter. Just look at those beasties. A couple of those big ole Texas Leicas for you to drool over. Check it out. My name is Erik Gould and I live in Pawtucket Rhode Island, USA. I am a museum photographer by day and I shoot a wide range of things, these days it’s pretty much all digital capture. My background is in fine art and I still make photographs for myself and I still prefer to do it with film. One can only sit in front of a monitor for so long. 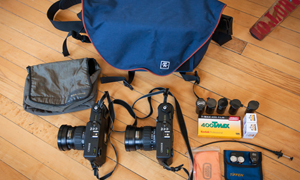 I have a number of bags, mostly broken down by size, I shoot 35mm, medium and large format. I chose this one to show for a couple of reasons. First this Crumpler bag was the only one I’ve ever gotten a compliment on. This was on a job and the compliment came from a real person, not just a gear obsessed photographer. She was just someone who appreciated a fine bag, I suppose. Probably the only time I didn’t feel like some pack mule toting too much gear into someone’s workspace. Secondly, it’s the Fuji. These two cameras have become my mainstay for my personal work, and I’m never happier than when I’m loading this bag into the car or onto my bike because I know I’m doing something just for me. It’s with these cameras more than any of the others that I get to go out and look at the world just as I like, to wander around, get lost and go where I want to. Life doesn’t allow that to happen all too often but I enjoy it when it does. The Fuji rangefinders are perfect for me in that I can shoot them handheld but the negative size is still such that I get excellent image quality. I have been, and I still am to some degree a large format guy and I enjoy making images with a full tonal scale and nice detail, but I prefer not to be stuck on a tripod all the time. 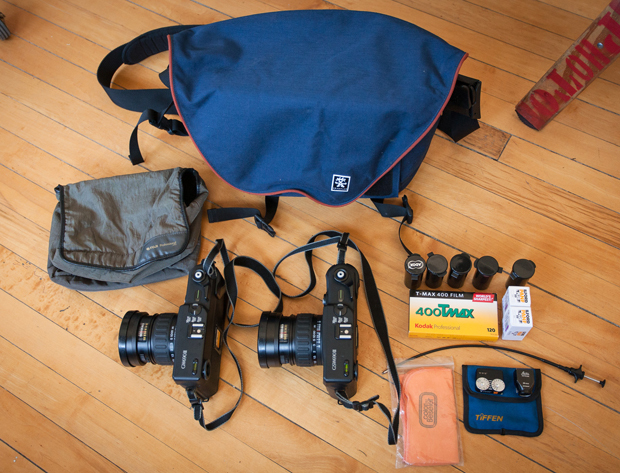 As to shooting, I don’t actually work out of this bag, usually I get to where I want to be, put one camera on each shoulder and some film in my pockets and go. Probably why the bag has stayed so clean over the years. TMY-2 film, love this stuff, so smooth. I process it in Sandy King’s Pyrocat-HD. Great combo. Ilford Pan-F, I like to keep some slow film around for when I do put the camera on a tripod, a la David Plowden. Cosina Voigtlander vc meter II, the fuji have no meters and this one is great to keep around, it’s tiny! Leica 28mm metal viewfinder, I put that on the GSW, It’s bright and less distorted than the camera’s viewfinder, looks cool too. Tiffen filter pouch that the meter and finder live in. The fuji rangefinders are sometimes called Texas Leicas but they aren’t really all that Leica like. They are pretty basic, fixed lens, no meter, with more plastic than you’ll ever find on a Leica M, but the lenses are great and they are very simple to use and focus, just no auto anything, which works for me. 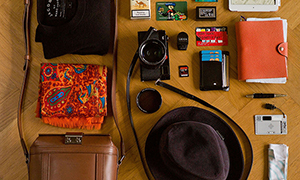 Thanks for sharing your bag with us Erik. It is great to see someone shooting the GW cameras, they are awesome. I love the lens on that camera.